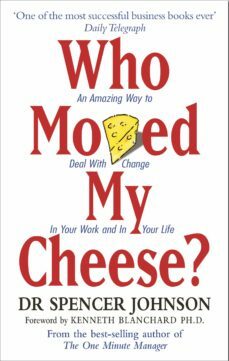 With over 2.5 million copies sold worldwide, Who Moved My Cheese? is a simple parable that reveals profound truths It is the amusing and enlightening story of four characters who live in a maze and look for cheese to nourish them and make them happy. Cheese is a metaphor for what you want to have in life, for example a good job, a loving relationship, money or possessions, health or spiritual peace of mind. The maze is where you look for what you want, perhaps the organisation you work in, or the family or community you live in. The problem is that the cheese keeps moving. In the story, the characters are faced with unexpected change in their search for the cheese. One of them eventually deals with change successfully and writes what he has learned on the maze walls for you to discover. Youll learn how to anticipate, adapt to and enjoy change and be ready to change quickly whenever you need to. Discover the secret of the writing on the wall for yourself and enjoy less stress and more success in your work and life. Written for all ages, this story takes less than an hour to read, but its unique insights will last a lifetime.Spencer Johnson, MD, is one of the worlds leading authors of inspirational writing. He has written many New York Times bestsellers, including the worldwide phenomenon Who Moved My Cheese? and, with Kenneth Blanchard, The One Minute Manager. His works have become cultural touchstones and are available in 40 languages.